Which corps has the best fans? 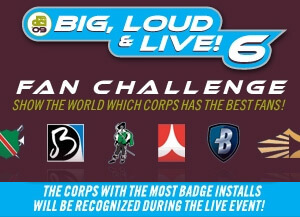 Show your support for your favorite corps by participating in the Big, Loud and Live 6 Fan Challenge! Big, Loud & Live 6, the live high-definition broadcast of the Drum Corps International World Championship Quarterfinals, will be shown in nearly 400 select theaters around the country on Thursday, Aug. 6. This one-night-only event will feature the complete performances of the top 15 World Class corps and highlights from the seven additional corps that will have performed earlier that day. To prove that your corps has the best fans, simply visit FathomEvents.com, select the image with your favorite corps' logo, and post the badge on your personal Web site or profile, such as Facebook. The corps whose logo is posted the most will be announced to thousands of fans attending the live broadcast event at theaters nationwide. Do your part to show which corps has the best fans and invite all your friends to watch the World Championship Quarterfinals on Thursday, Aug. 6! Download your favorite corps' badge from FathomEvents.com. Learn more about Big, Loud & Live 6 including theater and ticket information.